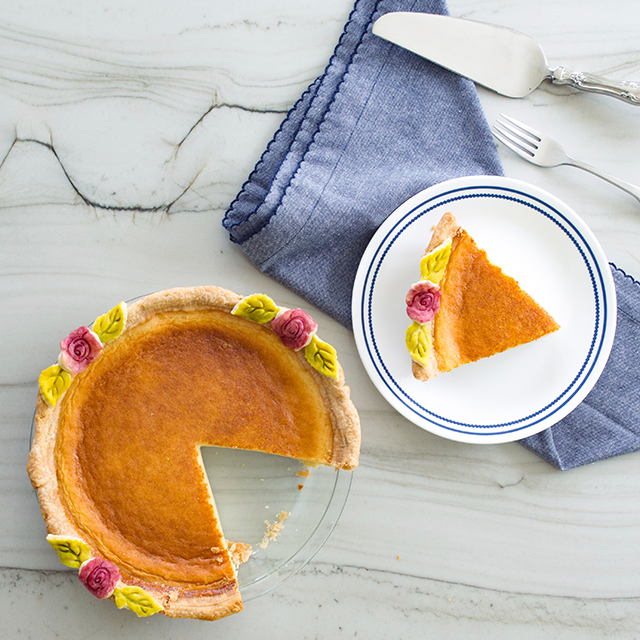 Whenever we’ve got the urge to indulge, Southern Fatty is guaranteed to satisfy our cravings. Penned and photographed by Nashville-based, Kentucky-bred Phillip Fryman, the blog and Instagram combine Southern-inspired recipes and regional dining recs for an all-around delicious experience. 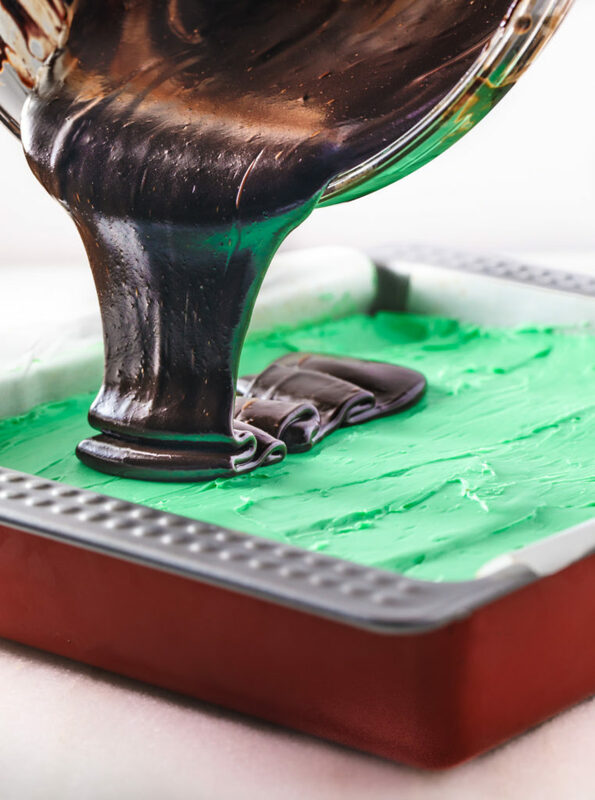 Here, the fearless foodie shares his recipe for Mint Ganache Layered Brownies—the perfect St. Patty’s Day treat. 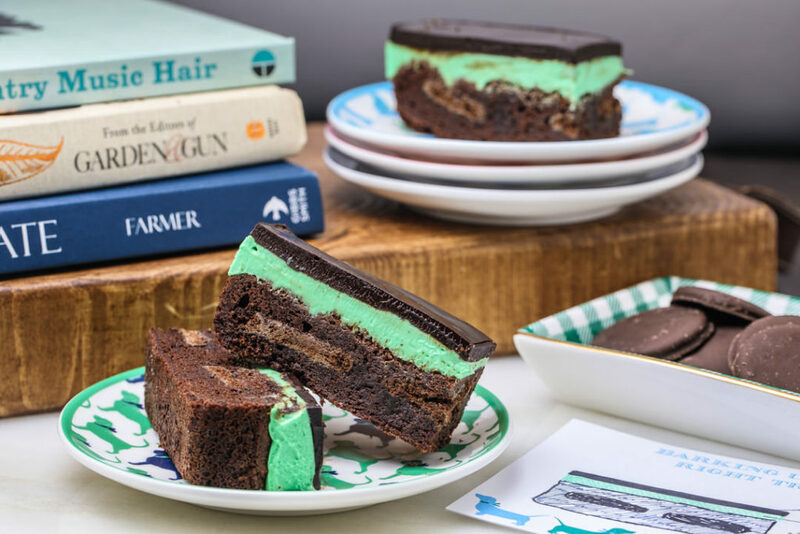 Mint Ganache Layered Brownies by Southern Fatty (recipe below) served on our Draper James Dog Ceramic Appetizer Plates and styled with our Draper James Dog Stationery Set, Dog Trinket Tray and various books available in our stores and online. Southern Fatty isn’t even your day job! Southern Fatty was the result of needing something to balance my work life. I moved to Nashville in 2010 after taking a position as a Cancer Research Biologist at Vanderbilt. I’ve always enjoyed baking, cooking, and photography. I’m totally that guy who is always taking pictures of his food in restaurants for Instagram, so the blog just seemed to make sense as a way to combine my love for photography and the midnight baking in my kitchen. The name of the blog was a joke college nickname given to me by friends after I found a way to fry just about everything in our apartment. I had zero expectations that the blog would grow into a second full-time gig like it has. There’s also something about comforting soul food that makes eating and cooking with friends so much warmer and more personal to me. It may not be friendly to your waist, but it sure is good for a few smiles. What are you drawn to more—the food, the photography, the cooking, or all of it?! I think the reason that the blog has done so well is because of my love for all of the different aspects of the creative process. I love recipe testing in my own kitchen. I get home from work and can’t wait to get started making something new for dinner (or dessert, obviously). It’s all relaxing and cathartic to me. That being said, if I had to pick one piece of the process, I would say that the food photography is what I really love the most. I’ve always enjoyed photography, and the blog has encouraged me to expand that skill set to a whole new level. What about your site and your recipes is uniquely Southern? It doesn’t take long to notice the type of recipes that I enjoy the most—it’s Southern Fatty, not Southern Skinny. Comfort food and twists on classic Southern favorites are what I am all about. I think I have maybe one salad on the site. I really enjoy taking the food that I remember from growing up in the South and making it something uniquely mine. I’m more of a baker than a cook, so the majority of my recipes are desserts. Give me some French fries and a bunch of cake, and I’ll just call that dinner. At the same time, what’s uniquely “Nashville” about Southern Fatty? Moving to Nashville has totally forced me to up my game when it comes to creative Southern bites. This city has exploded in the past few years in popularity, bringing with it some of the best food around. I definitely get a lot of the inspiration my recipes from local restaurants. I also share a lot of my Nashville finds on my Instagram. 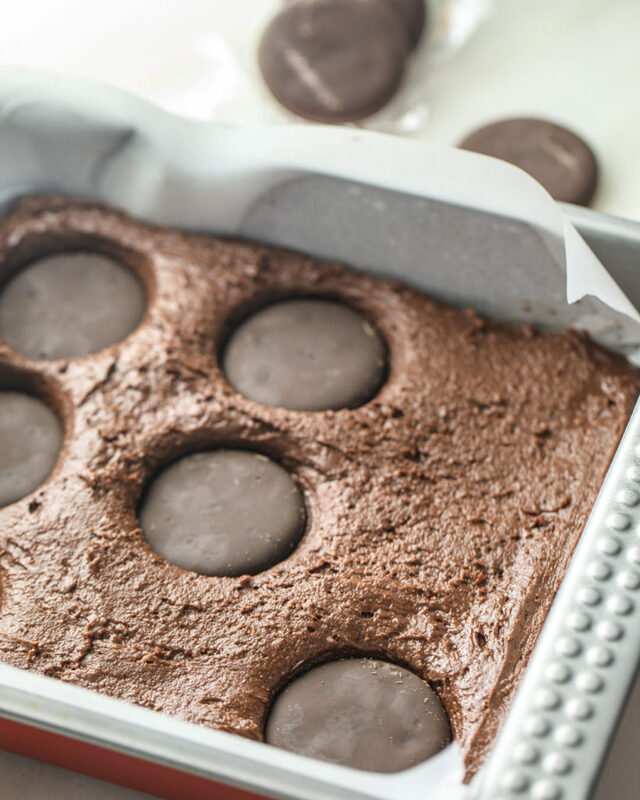 These brownies look amazing! Tell us about the recipe. Why did you choose it for St. Patrick’s Day? I am a mint-o-holic, y’all. St. Patrick’s Day to me means mint, mint, mint and a side of green beer (maybe not at the same time). I decided that if I was going to create a mint dessert recipe, it needed to live up to the hype. In addition to mint, I love brownies. Not just any brownies, though. They have to be those dense, fudgy, loaded brownies. In the holiday spirit, I decided to toss in some mint cookies when I baked them. 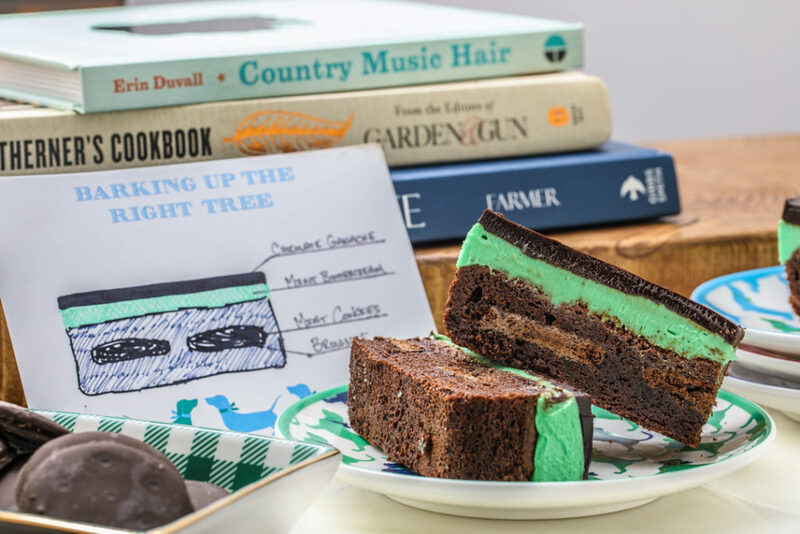 Layered with chocolate ganache and mint buttercream, the mint cookie brownie is like three desserts in one. 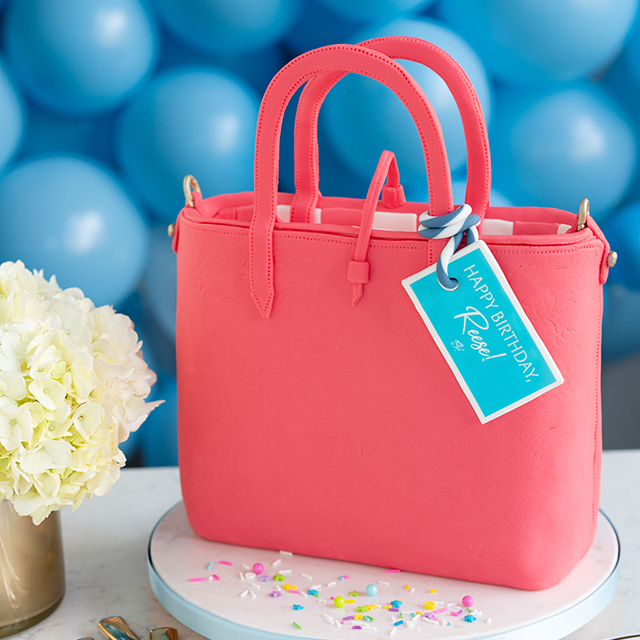 Tell us about styling the brownies to photograph with the other Draper James items you selected? Playing around with props that you might not always think about for your food shots is one of the best ways to grab readers’ attention. Books are always a favorite of mine to include in pictures because I think it is a simple way to really display a bit of character. Country Music Hair seemed appropriate, along with a couple others books that I have cooked from in my own kitchen during the past year. I’m a huge animal lover, so the pups on the dog plates, stationery, and trinket tray caught my attention immediately. How do you like to celebrate St. Patty’s Day? I celebrate St. Patrick’s like I do most holidays—by baking more than someone should be able to bake. If you can add green coloring to it, I’m gonna make it. If I’m feelin’ fancy, I like to venture out to McNamara’s. They have killer fish & chips, along with some serious Irish bands. Hands down, it has to be “bless your heart”. Most Southerners know that this is just our way of being a little snide, while keeping the manners that your momma forced upon you. Even so, it’s one that I catch myself slipping out more than I care to admit. 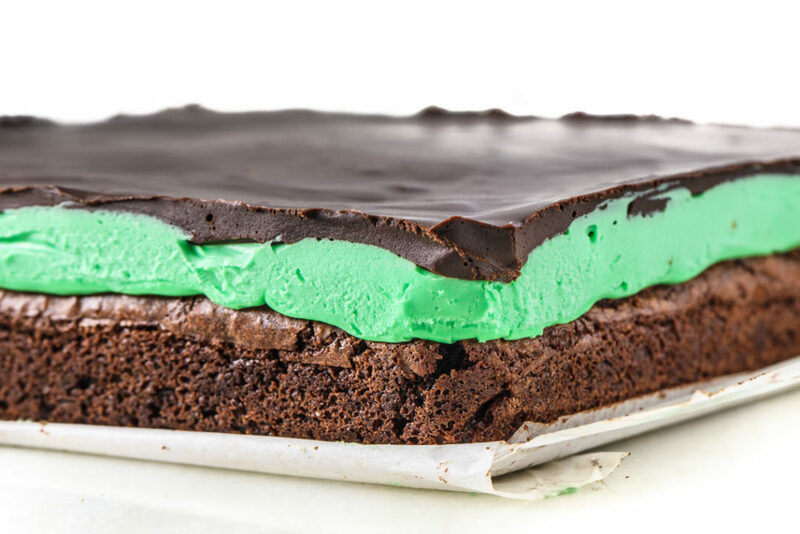 Scroll down for Southern Fatty’s recipe for Mint Ganache Layered Brownies. Brownies baked with Thin Mint cookies inside, topped with mint buttercream frosting and rich chocolate ganache. Pre-heat oven to 350°F. Grease 8-inch square pan. Add butter, oil, sugar, eggs, and vanilla to mixer bowl. Mix for a minute or so. Add flour, cocoa, and salt and mix until just combined. Do not over-mix. Pour into prepared baking pan. Press mint cookies into batter and spread batter over top to cover. Bake for 25-30 minutes until set. Remove to cool completely. Chill in refrigerator while preparing buttercream. Cream butter and sugar in mixer until light and fluffy, about 1-2 minutes. Add sugar and peppermint. Mix until well combined on low speed and increase speed to medium-high until smooth. Add cream as needed to get smooth finished buttercream. 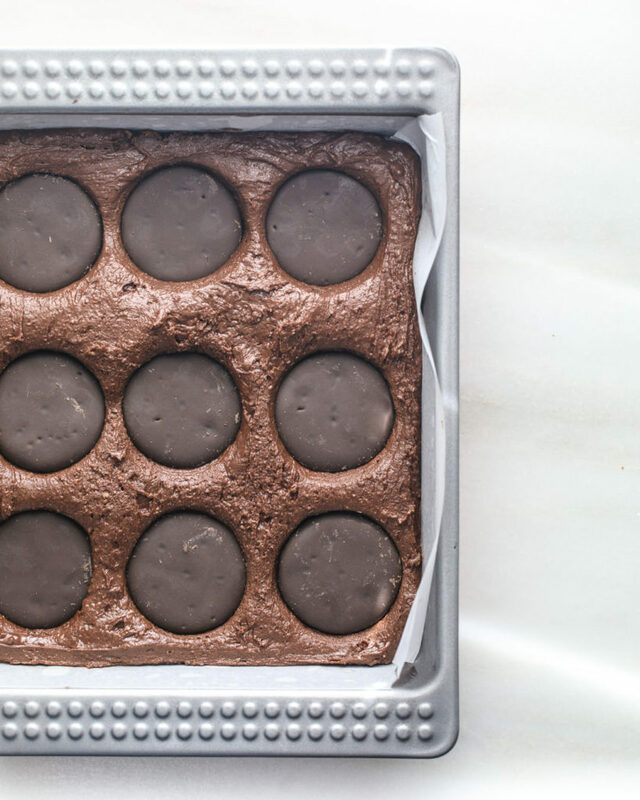 Take cool brownies and frost top with buttercream. Chill completely before adding ganache. Warm heavy cream in saucepan over medium heat until just starting to lightly bubble. 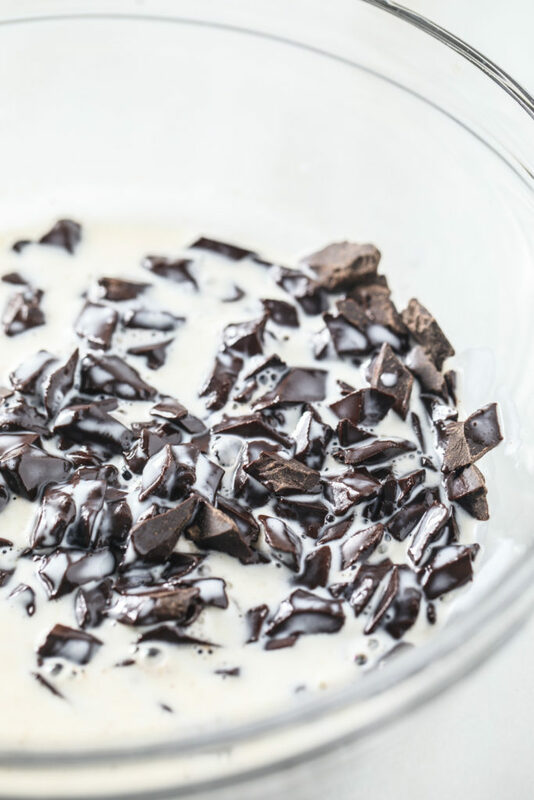 Remove from heat and pour warm cream over chopped chocolate. Allow to sit for 2-3 minutes to soften. Lightly fold, taking care to not stir too quickly to prevent air from incorporating. When ganache is very smooth, pour over chilled buttercream and return to refrigerator to set for at least an hour. Love, love, love those plates and books! Thanks for chatting with me!